Sunday morning, the city quiet as many residents have fled the flooding, I rode my bicycle for a first-hand look at the situation in the old city and along the river. What I found was not as bad as flooding further north, but it left me with the realization that our relative dryness is a tentative state, one that could easily change. 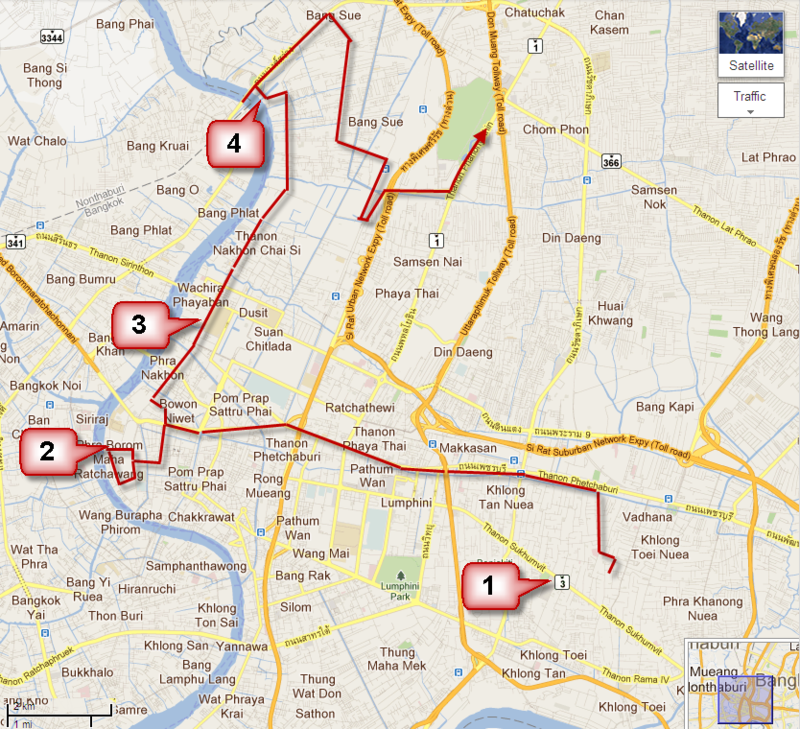 My ride took me west into the old city, around the Grand Palace, and then north along Sam Sen Road to the Rama VII Bridge. Most of the way, I was on the road closest to the river, giving me a chance to evaluate the neighborhoods. Like a checkerboard, some neighborhoods had water while adjacent neighborhoods were still dry. The dry neighborhoods were taking no chances, though, with walls of sandbags or brick and cement erected in front of shops, buildings, and homes. These photos were actually taken Friday night, when Tawn and I drove to the Emporium shopping center at Sukhumvit Soi 24 to watch a film. 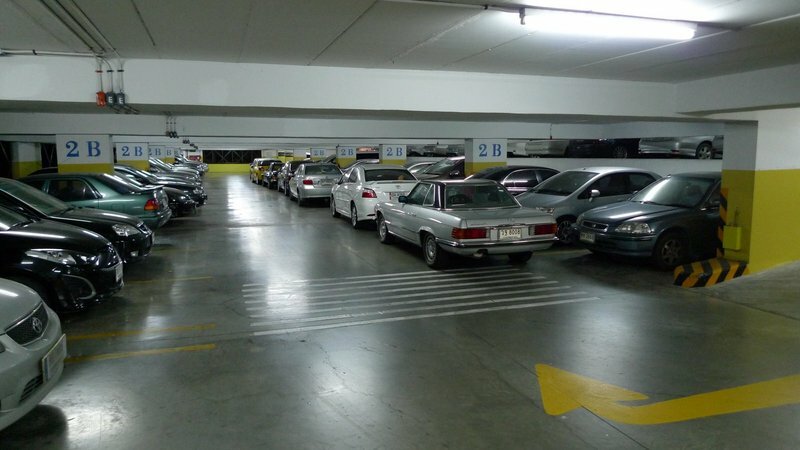 Both parking structures were packed, not with shoppers’ cars but with cars that had been parked there for safekeeping. Cars were double parked, left in neutral gear so they could be pushed out of the way. To park in the only available space, we had to push six other cars out of the way. I can tell you from this experience that classic Mercedes are very heavy and do not roll easily. 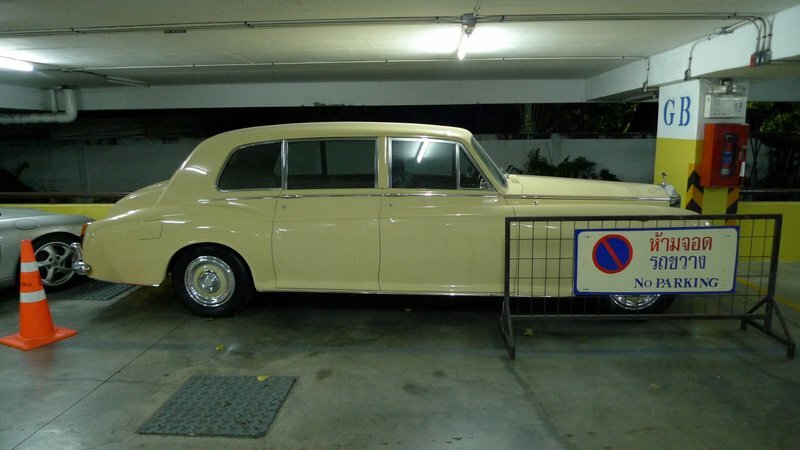 We noticed that someone had parked a pale yellow Rolls Royce Phantom with an auspicious license plate with the numbers 9999 on it. (The current king is Rama IX, so nine is considered a lucky number.) Inquiring with the guard, I understand that the car’s owner is someone very high up in one of the government’s ministries. The guard also shared that this person has parked 26 cars in the lot. Perhaps the government’s scheme to encourage car ownership is working too well? All of these cars had a notice placed on them (after they were not moved at the end of the night) asking the owners to contact the management office before leaving the car park. Presumably, there will be some sort of a fine for unauthorized long-term parking. I would guess some people probably won’t have to pay that fine. 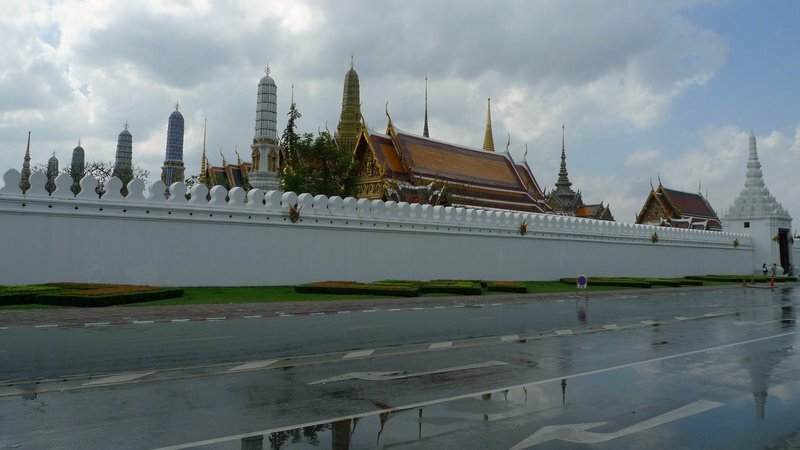 The ride to Phra Nakon, the oldest district of Bangkok, was smooth as so few cars were on the road. Along the way, streets were dry and canals were at close to their normal level. When I came up to Khlong (canal) Khu Meuang Derm near the back side of the Ministry of Defence, I encountered the first flooding. While not deep – about 10 cm (4 inches), it covered most of the blocks adjacent to the canal. 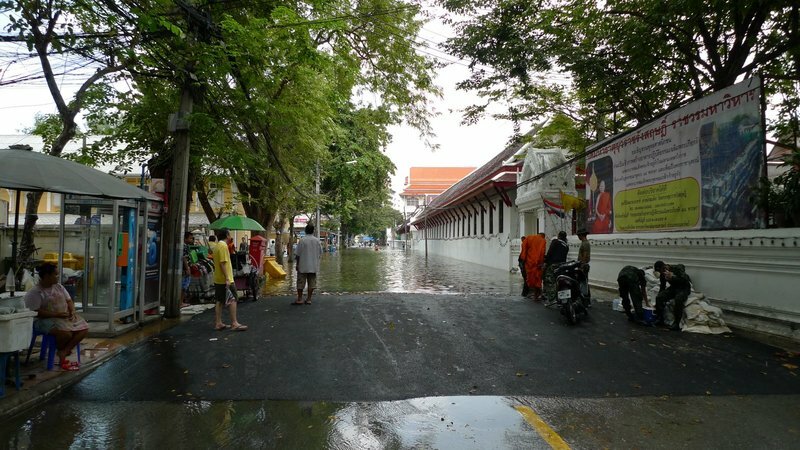 I rode around the north side of the Grand Palace where the street had moderate flooding (the far two lanes in this picture) in some areas. 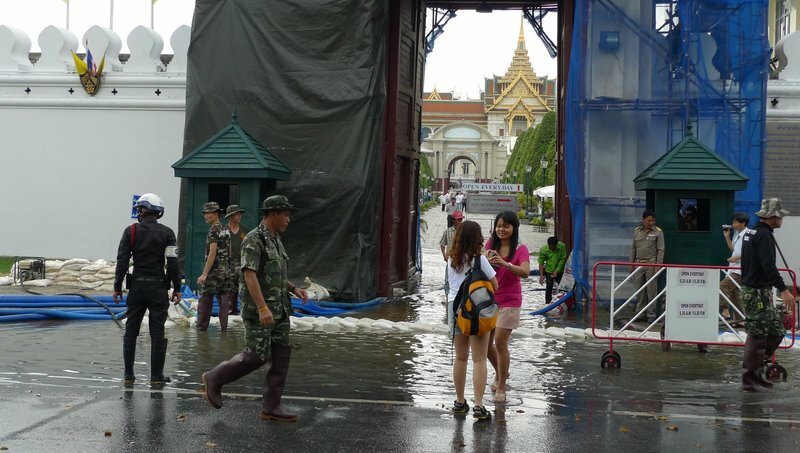 The entire road around Sanam Luang, the large field to the north of the Grand Palace, was flooded a bit more, with the entire road under about 15 cm (6 inches) of water. The Grand Palace was open for business (tourists note: the Grand Palace is open every day, no matter what any scam artists may try to tell you) but there were few visitors. The entry gate, pictured here, was under about 30 cm (1 foot) of water, requiring visitors to balance on sand bags as they made their way inside. Around the corner from the Grand Palace, closer to the river, is Maharat Road leading to Thammasat University. Flooding was more severe in this neighborhood and a barrier had been built in the street to contain the water. Vendors were still working on the sidewalks and residents (and monks from the adjacent Wat Mahathat) were coming and going as best they could. One vendor explained that the area had been flooded for the past four days. When asked whether the water was still rising or was falling, he replied that it depended on the tides. 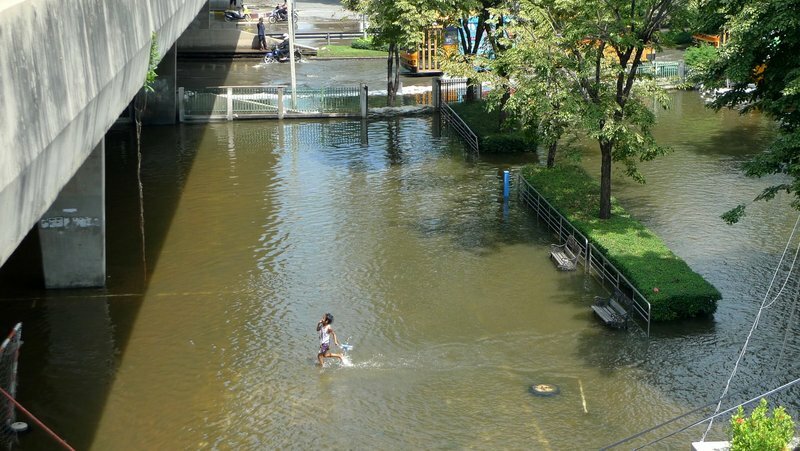 One block away from the river, Na Phrathat Road runs along the west edge of Sanam Luang, passing the National Theatre and National Museum. It was closed to through traffic and has about 15 cm (6 inches) of standing water. Heading north from Phra Nakhon, I rode along Sam Sen Road through the Dusit District. There, I found the same checkerboard pattern of flooding. Some stretches I rode through the water that reached the bottom of my pedals, about 15 cm (6 inches) high, although waves caused by passing vehicles left me with wet shoes. There were points where the roads were impassable, so I cut east one block, rode a few blocks north, and then returned to Sam Sen Road to find it dry again. The dry areas looked like they might not be dry much longer. Here, I passed through an otherwise dry neighborhood and found water bubbling up through the manhole cover. 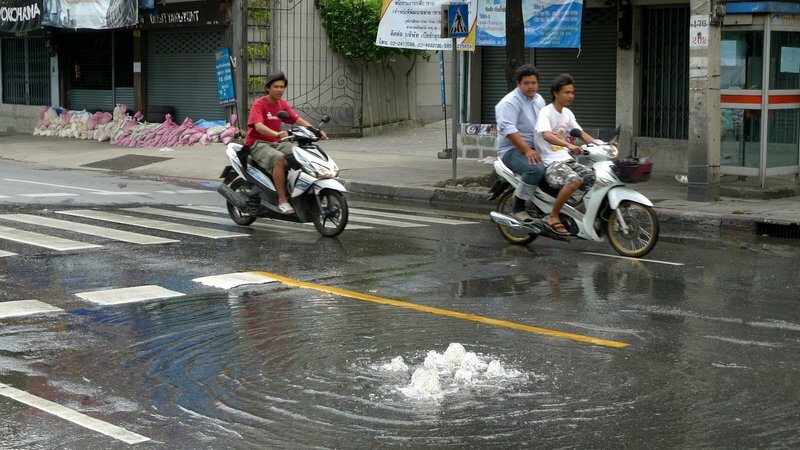 Passing motorbike riders gazed warily at the water, which ran across the road and into the storm drains. 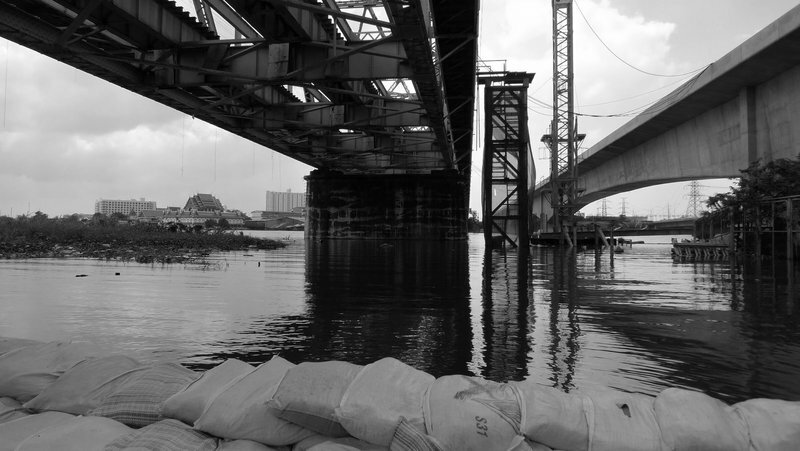 Underneath two railway bridges just south of the Rama VII automobile bridge in the Bang Sue district, the river threatens to spill over its banks and an extra layer of sandbags marks a last line of defence. The bridge belongs to the State Railways of Thailand. Just to the right of the frame is a second bridge (to the right of the crane) for the under-construction pink rail transit line. To the left of the previous picture (of the bridge), the road comes immediately adjacent to the brimming river, right at the entrance to Khlong (canal) Sung. The water gate for the canal is shut in order to protect the district from flooding. 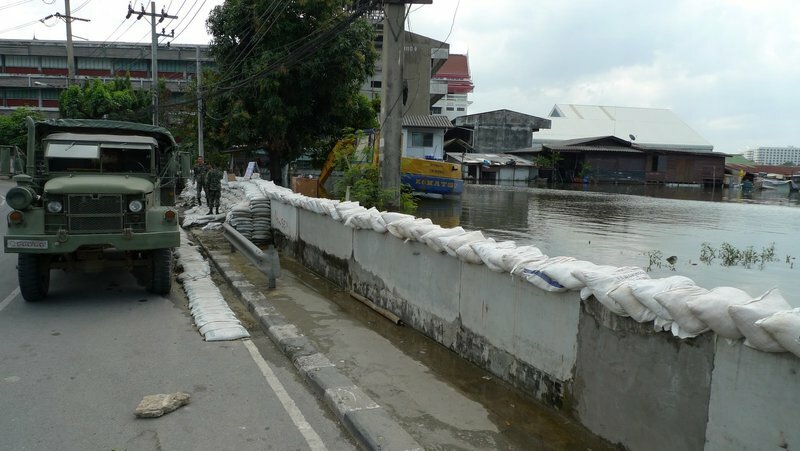 Soldiers from the army were on hand monitoring the situation and adding sandbags as necessary. 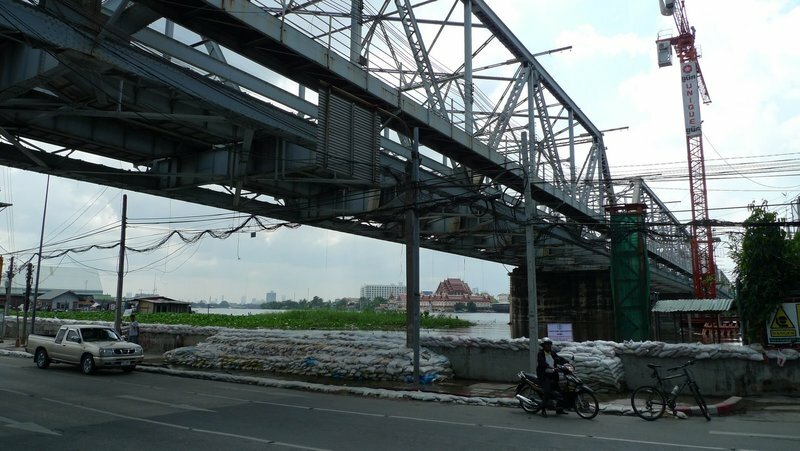 Just a short distance north, I rode across the Rama VIII Bridge and stopped to take pictures. There were several people fishing from the bridge, but I noticed this man who was fishing from the waterfront park underneath the bridge. Because of the flooding, it is hard to tell where the river ends and the park begins. In the same waterfront park, a boy ran through the water as buses passed on a moderately flooded frontage road. After having pedaled about 30 km, I headed inland past the closed and sandbagged Chatuchak Weekend Market (which I’ve never seen closed on a weekend! ), taking the Skytrain home from the Mo Chit station. While I didn’t travel further north into the more severely affected areas of the city, what I saw was enough to make me realize that even though we’ve passed this week without flooding in many of the central parts of the city, those areas that are still dry, remain so only because of luck and limited rainfall. 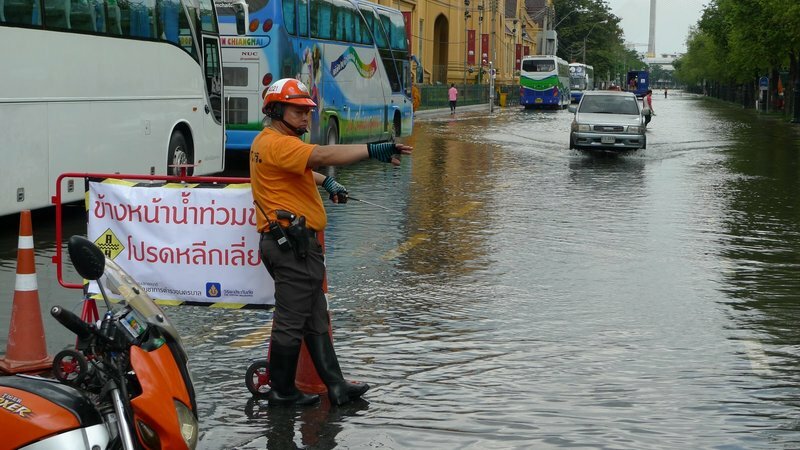 Water is bubbling up through the drains and seeping through the sandbags and dikes; it seems inevitable that some of those defenses will fail before the excess water is moved safely to the Gulf of Thailand. I suspect that the risk to the area I live in is relatively minimal, but I think we have another week or two before the city as a whole is out of the gravest danger. This entry was posted in Uncategorized and tagged Bangkok, Bridge, Flood, Flooding, infrastructure, Krungthep, thai, Thailand by christao408. Bookmark the permalink. Thanks for this first-hand impression. Hope it will go away without too much harm. @beowulf222 – Just added a brief video. I hope the flood recedes as soon as possible. Chris, this looks pretty bad and I am concerned that it will get worse. We saw some flooding in New England in September. You can’t help realizing how powerless we are against Mom Nature when she gets pissed off! You and Tawn will be in our prayers. I saw a similar news coverage a few hours ago about the flood too. Seems like your video gets us to a closer look of the situation, especially towards the end. Well, if someone up there in the beauracrats diverted the excess water to other channels/passages months earlier, the situation might be better off by now. I wonder how many people will celebrate Loy Krathong which is coming up soon? Are you able to work ? Because two more weeks of this, can mess up the economy pretty much. I bet they didn’t leave the Rolls in neutral. bought your bathing suit yet? I’m so glad you are still dry… The flooding is less than what I had feared. My imagination usually runs away with me. Thanks for the reality post! Good that you are both staying dry. I know of that a lot of the problems will increase as the water decreases. It took almost a month before our city was anywhere close to normal. Thanks for giving us a glimpse of what it’s like over there. Very interesting to read and see. Seems like they took good care of it. I saw on news that the domestic airport is completely flooded, it looked like a massive lake. Hope the waters recedes soon. @Dezinerdreams – Yes, Don Mueang, the old int’l airport, is out of operation for the moment, with about 15 cm of water on the runways and apron. It is used only for a limited number of domestic flights, though. Most of the domestic flights still operated out of the newer airport, so the flights from DMK were simply transferred over to the new airport for the time being. @FallingSafely – @bmojsilo – @Roadlesstaken – Thanks for the recommendations! @Fatcat723 – Yes, a lot of the difficulty comes after the flood waters, with disease and pests, among other things. @murisopsis – Our imaginations and the media both tend to run wild, huh? =D@Made2Order – Ha ha … no swimsuit. Actually, after the bike ride I had to give my socks and shoes a thorough washing as that water smelled awful. @Ricardo98 – I would suspect not! @The_Eyes_Of_A_Painter – Thankfully, my work has not been interrupted. I work from home and we’ve had no power interruptions. 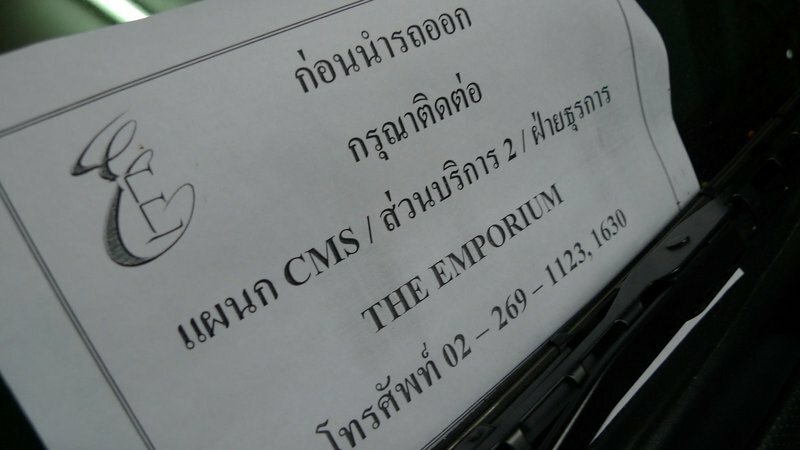 @CurryPuffy – You’re right; I bet Loi Khrathong will be impacted this year. @RakkaRay – Thanks for your thoughts and prayers. One thing I remember reading a few years ago is that flooding causes more damage and death in the US each year than do any other types of natural disasters. I wonder if the same holds true worldwide? @oxyGENE_08 – Oh, I hope so too! @Redlegsix – I should do more videos, shouldn’t I? For you and Pat, if no one else. I was going to ask if your shoes & socks smelled but I just read your response to Jack. On the news, I just see people wading through the floodwaters. I just wonder how they will be able to maintain some level of hygiene and sanitation. I hope the water will start to recede soon. The transit bridge under construction is for the Purple Line. The Pink Line is still in the planning stages. @Lutzie – Perhaps that’s just a sign of color blindness on my part… the version of the transit master plan I took off 2Bangkok.com has a color that I initially took as pink but on second glance in different light, maybe it *is* purple! =D Thanks for the correction. 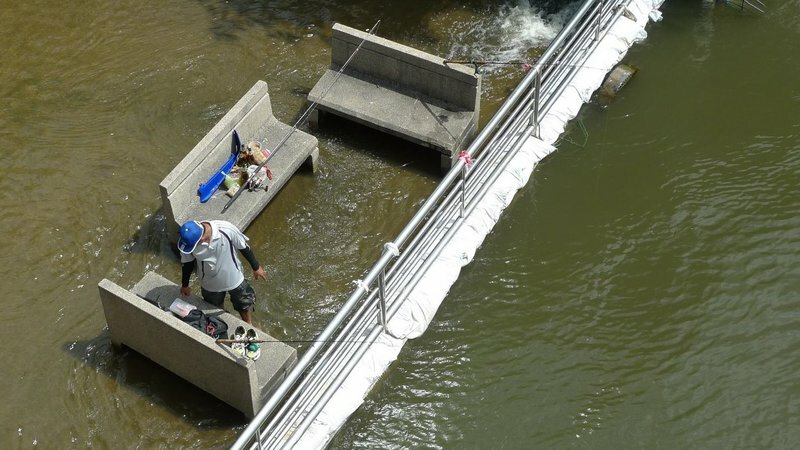 @regsuzuki – No doubt there will be something new and interesting to consume one’s attention after this flooding business passes. @ElusiveWords – They won’t be able to maintain any level of hygiene and sanitation, unfortunately. Skin diseases, digestive diseases, etc. are on the rise.